The posts have been lacking lately but with a change in the seasons coming, times are busy! After a solid solo morning trip for gills, the main focus of my day was an evening trip I had planned with a buddy. He wanted to catch some cusk but after a few weeks since my last trip, I was unsure how the bite would be. Regardless, I had a bucket of dead shiners and plenty of batteries for the headlamps. We were set up well before dark with cutbait staggered between 20-60 feet of water. No action occurred before sunset and it took a while for anything after dark set in. With a super slow bite in progress, we hooked up the hydro glow and jigged up smelt to pass the time. 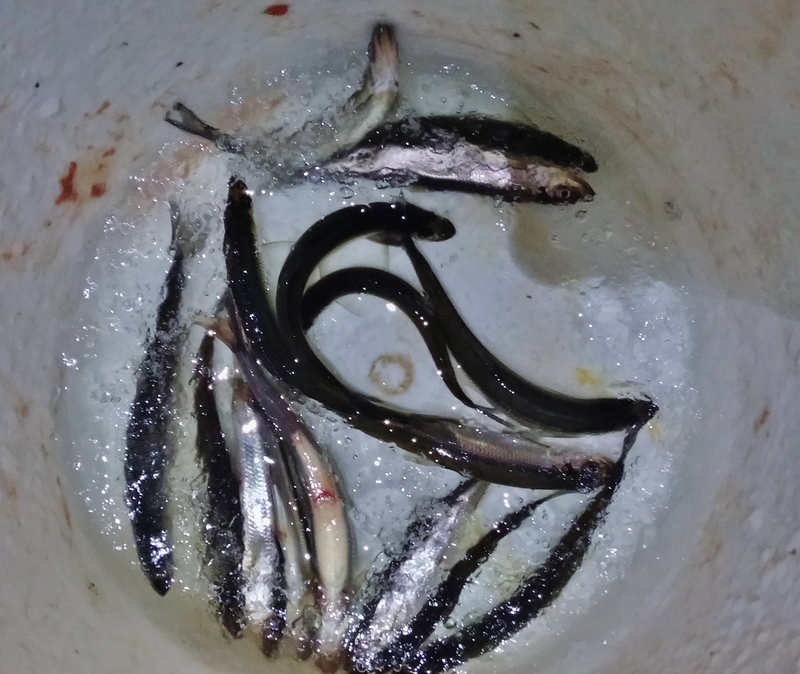 Fortunately, the smelt were willing to bite. With only a few cusk coming topside we at least redeemed our night. After a few hours we packed things up and made way for home! 3-8-15 – Good Thing For Persistence! Our hopes were high that we were going to find crappie in a pond that we had never been on before. It was going to be a nice day the only X factor was going to be the snow conditions in a part of the state we hadn’t been to recently. Our hopes were quickly squashed when we saw a lake untouched by anyone and a bout 18″ of crusty snow. Regardless, we packed our sleds and made way for a few spots we identified by means of satellite imagery. The walking was miserable and the loads of small perch and bluegill were over whelming. The highlight of this stop was capturing some cool footage of crawfish in shallow water. After struggling to make it back to the truck, we came up with a new game plan which included a well traveled spot that was sure to have had some recent foot traffic. We grabbed some lunch and got back on the water. The walking was much better but the fish were still no where to be found. Our past experiences here were that the morning bite was the best but you could still pick all day long as the fish constantly moved around. Between three of us, we caught one fish from noon to almost 3. Things were not looking good. We tried three other spots before coming up with a quitting time. As we returned to our first stop at the new location we said 3 was the cut off. If the fish weren’t biting we were going home. Wouldn’t you know it, at 2:55 it happened. 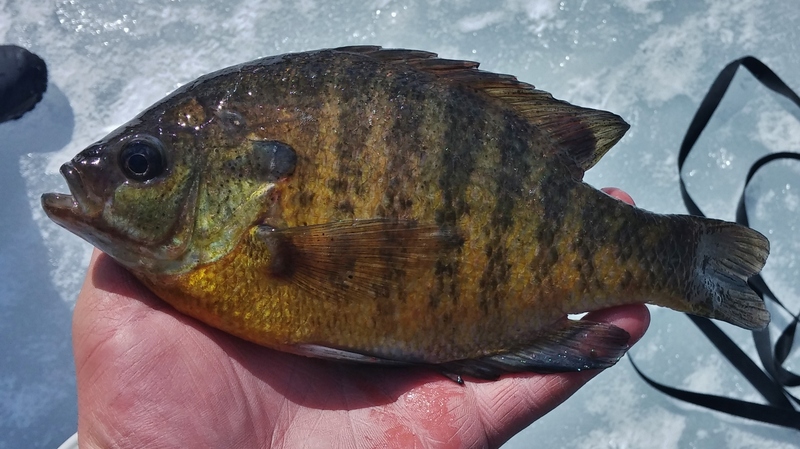 The big perch moved into the shallows and by 4:30 all three of us we were off the ice with limits of slabs! We could have called it a bust much earlier in the day but our stubbornness kept us going and it paid off! Does anyone like slush? I don’t think so. The slush today was bad and it got much worse as the day wore on. We began the day in the dark and set up in a new location. It took a few extra holes to the a good layout of the area but when all was said and done, our spread spanned a depth range of 5-24 feet of water. The flags started immediately with a few run and drops, bass, and pike. The target were walleye but they sure were playing hard to get. As the day passed, the action remained slow and flags became more scarce after about 11am. We made a small move with a few tip ups in the early afternoon after seeing a walleye on the underwater camera which my buddy jigged up almost immediately after. The move proved ineffective but it was closer to walking off none the less. 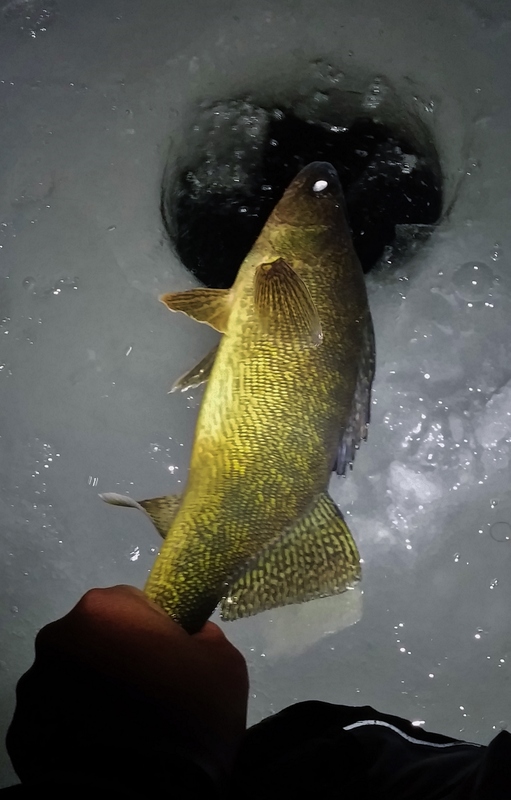 At dark we gave the bait a few more minutes to soak in hopes that the walleye would move in. The final few traps yielded a walleye and a bass. Whether they were on for a bit or us moving closer made them finally move, it’s fun to see a flag spring up under the bean of a headlight! It was a tough day but even a tough day is good. It makes you appreciate the good days that much more! I had plans to fish alone for the day but a buddy was getting out of work early for an evening smelt bite. I figured it made sense to be in the area so I headed to a nearby panfish pond. It was a beautiful morning with temps getting into the mid 30’s by the afternoon. The fish bit well to make things even better! 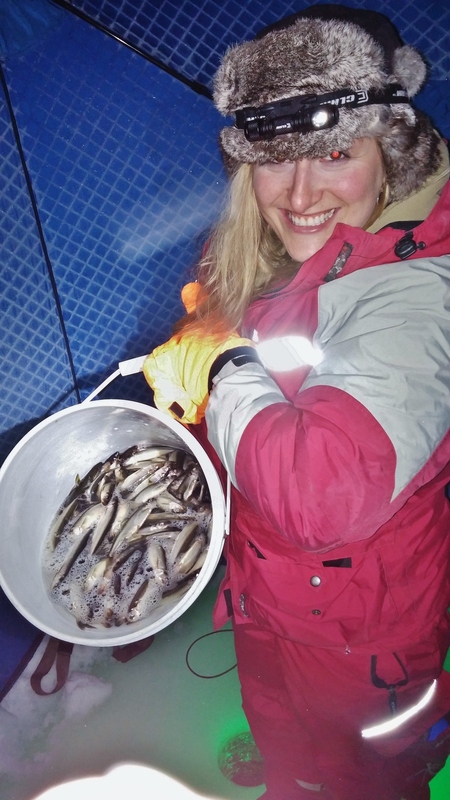 I found fish in a concentrated area and only had to cut about a dozen holes for the duration of my time there. I fished above the weeds with an orange Caty teardrop and maggots. 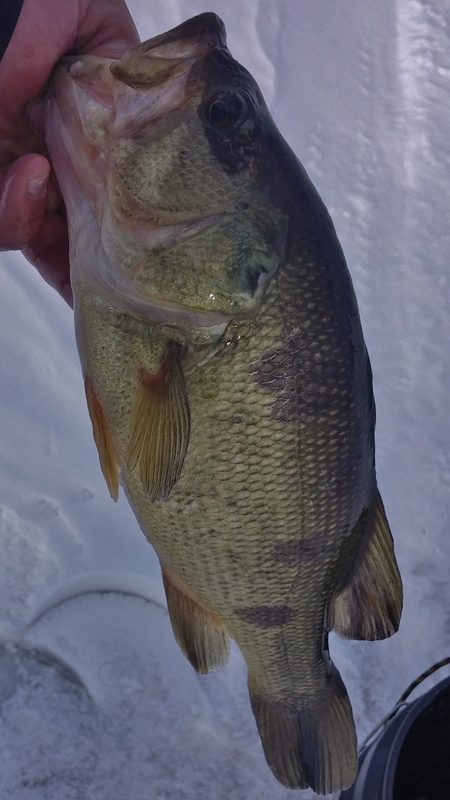 The fish were aggressive and I was able to sight fish once the holes stayed clear of slush because of the sun. While all the holes had different weed layouts, there were a few with weeds almost to the surface. 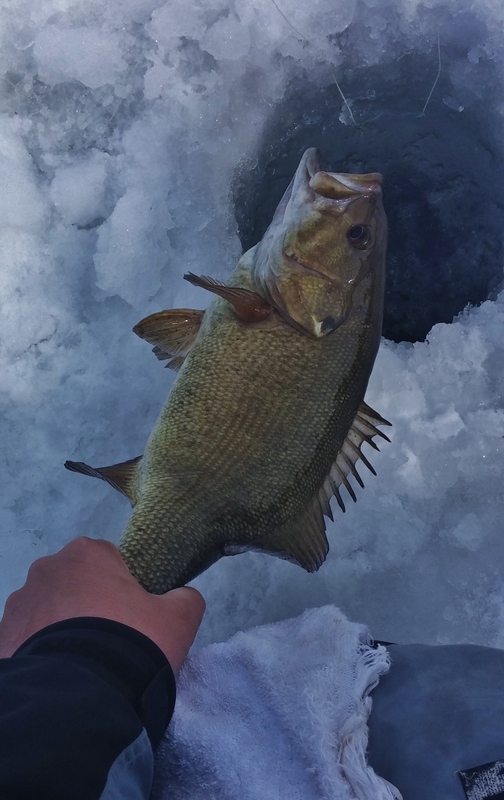 Those holes with tall weeds allowed me to catch the fish within about a foot of the ice. What fun! Around 3, I packed up my gear and made way for our rendezvous point at 3:30. 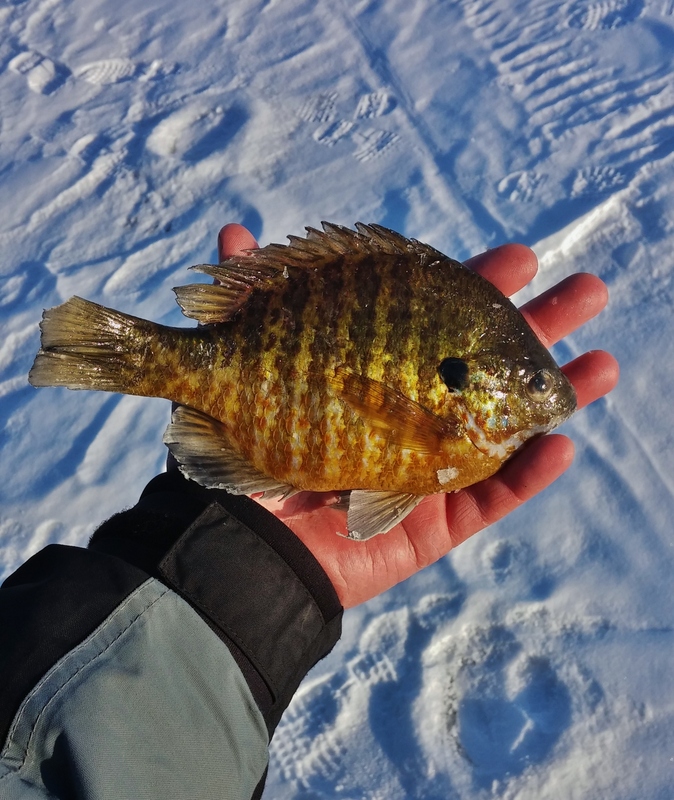 The smelt spot we selected was ideal because of a plowed area nearby that kept us from having to risk getting stuck in the 16″ of hard packed snow that blanketed the entire lake. We guessed that the depth would be around 40′ deep. 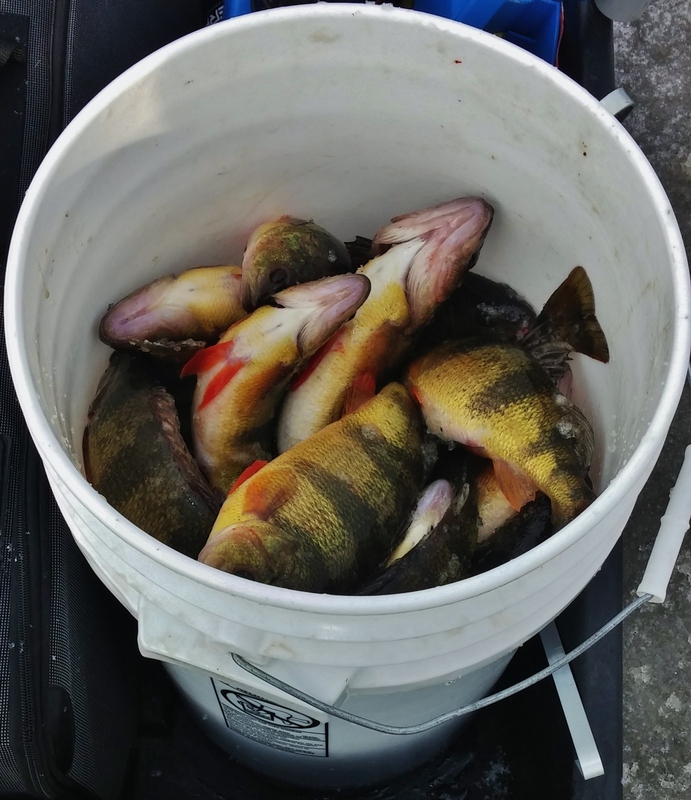 The fishing began slow with a few yellow perch being the first guests coming through the hole. 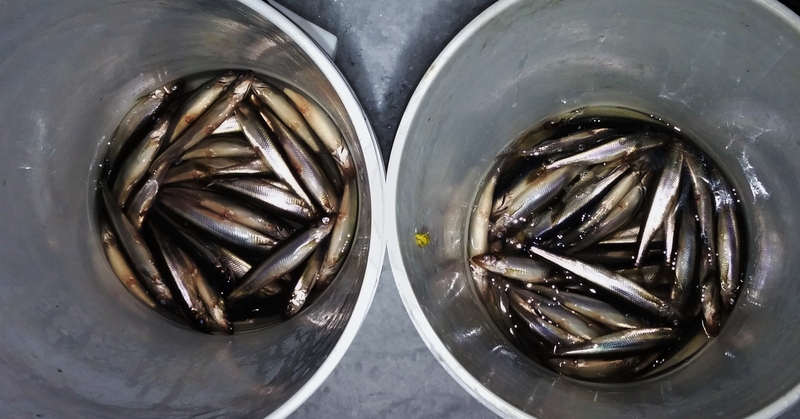 As darkness approached, the smelt showed up in force. At first, they were staying loyal to the bottom but after landing a few, they began to suspend higher and higher. While the fishing was good, it wasn’t as good as when Mary and I went recently. The fish tonight were much more hesitant of coming right to the surface. They still bit hard we just couldn’t sight fish! 3-5-15 – Spring Is Coming! 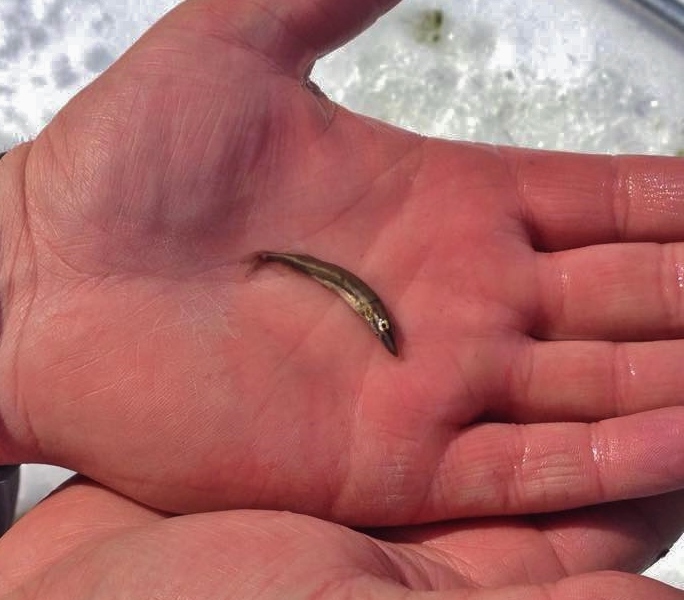 The fish are starting to stage up in the areas we wait to see them in all winter. These are the times when big catches and big fish are the norm. Whatever you enjoy fishing for, there aren’t many times better than this! I had a relatively slow morning for keepers but the number of small fish was unreal. As I neared the limit of small fish coming through the hole, I started to scheme where else I could go. I settled for a nearby cove. 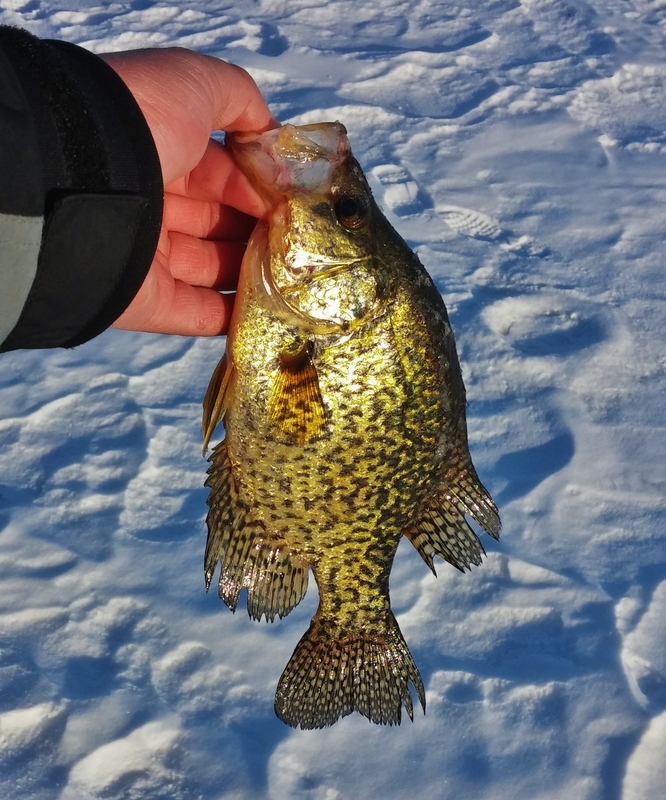 It took a bit to find a concentration of fish but I was rewarded with big seeds and footlong crappie. They were set up in sparse weeds with a large thick mat nearby. As the hours passed the quality never changed. I hole hopped until it was time to head home and had a mess of quality fillets! 3-1-15 – Where Was The Warm Weather? The weatherman called for a nice day and was right but he was way off on the wind forecast! We set up on a recent bite that we had located with hopes the fish hadn’t moved. The fish were there but no concentration remained. We fished round and round searching for something better. We cut in all directions but only one or two quality seeds would come from a hole. 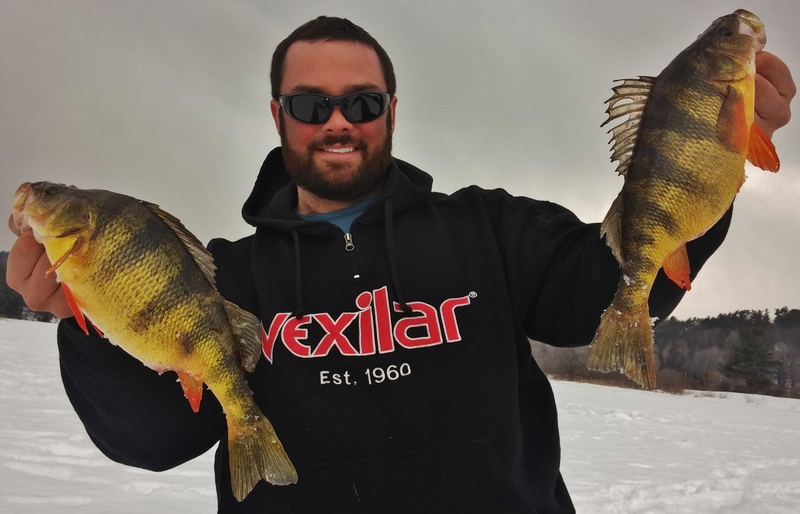 As we got further from our initial waypoint the number of perch in the 7-9″range was unreal! Happy to be catching fish as quick as you could pull them, we posted up. The fish bit until the cold wind drove us home around 4. While the flatfish weren’t there in numbers perch saved us. Maybe next time things will be better! Mary and I had to postpone our Valentine’s date due to weather issues but we finally made up for it. It was a cold night but with the Clam Bigfoot XL4000t and a Mr. Buddy heater, it was comfortable. 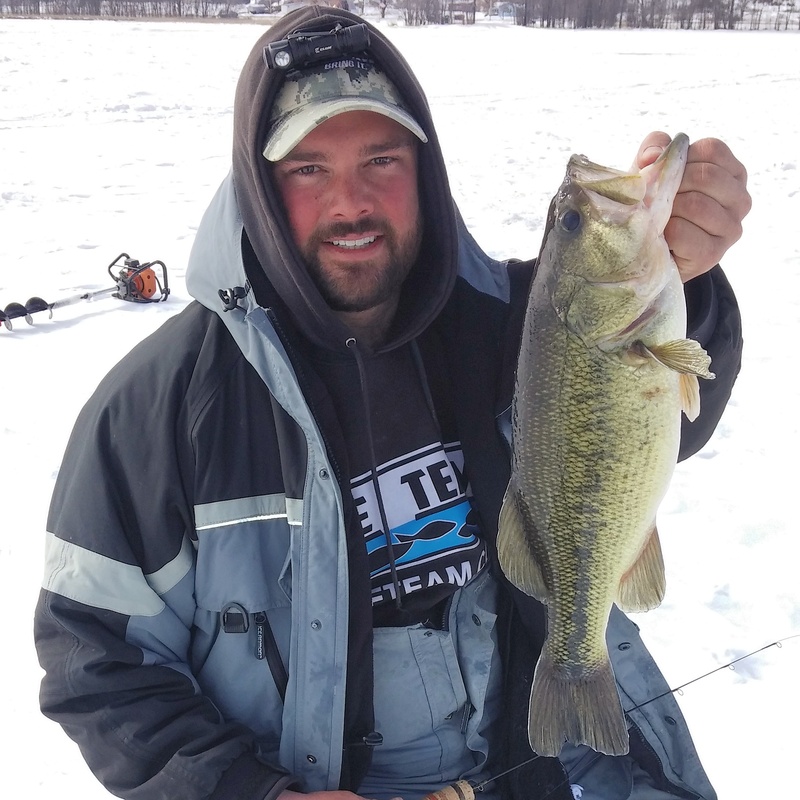 We hadn’t been smelt fishing together yet this winter and on this particular lake, our experience was limited. Regardless, we set up the shack after shoveling a foot of snow so we could have some smooth ice. It was still light out and there were no fish on the screen. but we had to start somewhere. After setting up the Hydro Glow Fishing Light and rigging up our rods, the sky was dark and we started the first descent. As we neared bottom, flickers appeared and the night bite began. The fish were biting but stayed loyal to the bottom. The goal was to move them towards the surface so when we did hook up we tried to reel them in slowly so that the others would chase up. We were able to move the fish up after only a short while, but any commotion nearby scattered them right back down. Even someone just shutting a car door ended the bite! Fortunately, they were aggressive enough to come back up with little effort.